The June 19th patch made changes to the gardening system. There are now only five stages to evolving plants from normal to perfect. 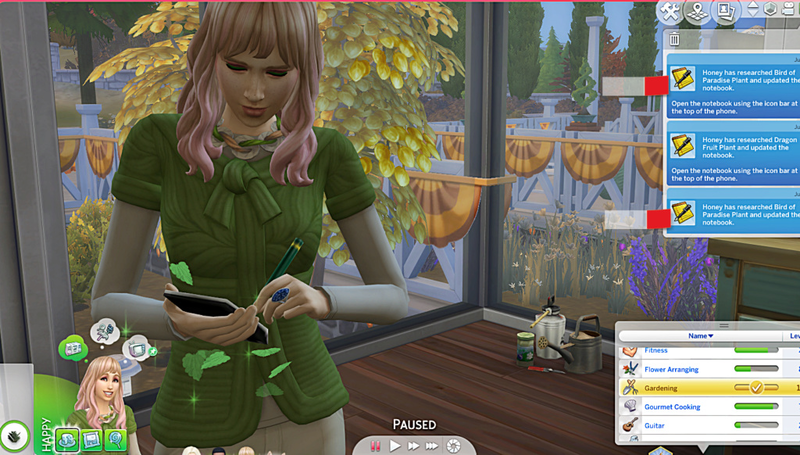 And if you have the Seasons EP some plants will grow during certain seasons and be dormant during others. Sounds good ... right? Except like me many players are finding it difficult to get plants to evolve in a timely manner. I am sharing some of my research in this thread and welcome any feedback of your own experiences. "I'm not sure this is necessarily a bug, I think it might just be part of the new gardening design. Evolutions have slowed down, as it's now an end-game long-term goal. The Evolve commodity starts at around 50, and evolution is available at 100. Fertilize gives a solid amount of evolve commodity, depending on the quality of fertilizer but it's around 8. So you need to fertilize a plant about 7 times before it's ready to evolve. There are other factors that can affect the evolution rate as well, such as sheltering the plant. Sheltered plants have the benefit of being protected from the seasons but the evolution rate is much slower. Bluebells, for example, evolve 4x slower when sheltered than when not." I will look into filing an issue regarding the Lessons not explaining all of this thoroughly enough. But if, after reading all of this, you believe that your game is still bugged and your plants just aren't evolving period, I would appreciate a save file to help us investigate." "Splicing can produce a new harvestable, but there's supposed to be a lower chance that it does this. This is by design. For example, grafting a rose to a grape for bonsai buds will have the plant produce roses OR grapes OR bonsai buds, with the bonsai buds having the lowest chance. So if you're not seeing the new harvestable, I think it might just be a case of bad luck"
My issue with this change is it also lowers the change of getting other things that depend on having one of the spliced harvestables. I like the five step evolution idea in the upgraded gardening system but thought it was supposed to make things easier. Not happening and leads to frustration. @EuphorialQueen Rare seed packets, available in Build/Buy, were added to help with this. I understand the intent of the rare packets. I am grateful they are available. Getting ONE Bonsai Bud /maybe/ for 250 simoleons or worse paying 1000 simoleons for two magic beans .. ? I love this game and I am not going anywhere. I just don't want it to be impossible to complete certain goals within the limits set by the game. I don't enjoy having my Sims garden anymore. Seems everything is topsy turvy. I like some of the improvements so far. I moved plants on the last day of their "season" into my greenhouse and they seem to be growing and producing fruit. I haven't had time to really test much or see how the splicing works anymore. Short answer... it (splicing) doesn't. Or at least it is not a sure thing. Bird of Paradise is not showing in the notebook after researching. A new series of video guides may come in handy. Thank you!!! That was extremely interesting and helpful! That was very good. Thank you, EQ.